The original Victorian plan for the Birmingham waterworks was to build four dams in the valley of the River Elan, and three in the valley of the River Claerwen. 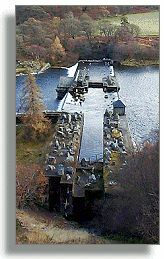 The Elan Valley dams were to be built under the project which started in 1893, and the other dams on the Claerwen later on when more water would be needed as Birmingham continued to grow. The lowest of the three dams planned for the Claerwen Valley was Dol-y-Mynach. You can see from the cross-section (side view) of the valley above that the base of this dam would be underwater when Caban-coch dam was finished and the reservoir was full. This meant that work on this dam had to start at the same time as the other dams in the next valley, so that there would be enough of the dam above water to continue with the building later on. But the dam at Dol-y-Mynach, which was to have been almost 31 metres (101 feet) high and 286 metres (938 feet) long was never finished, and the other two dams shown above it in the drawing were not even started. A much bigger dam higher up in the valley, the Claerwen Dam, was completed in 1952. When water levels are low enough you can see the base of the dam that wasn't finished, and it shows how the Victorians built the other dams. There are huge stone blocks of around ten tons each in the middle, set in solid concrete, with well cut masonry on the outside.